St. James Church was packed to its limit last Sunday evening when a memorial cross in honour of those who laid down their lives in their country's service was unveiled. The solemn service opened with a muffled peal and the National Anthem, then followed appropriate sentences from the first portion of the prescribed evenings service. Special lessons were read, special prayers were offered by the Rector, Rev.A.C. Buss and the hymn "O God our help in angels past" was sung by choir and congregation with much spirit. During the singing of the hymn "Fight the good fight" the collection for the war memorial was taken. 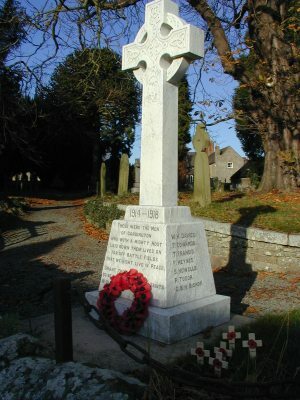 Next the members of the choir, ex-service men on parade and relatives proceeded to the veiled cross, situated exactly opposite the school entrance and near the west wall of the church, whilst the congregation assembled immediately in front of the cross. The hymn "for all saints" was then sung followed by Psalm 23 "The Lord is my Shepherd". The Rector having read a prayer, the silence was broken by the soundings of the "Last Post" and then Major F.A. 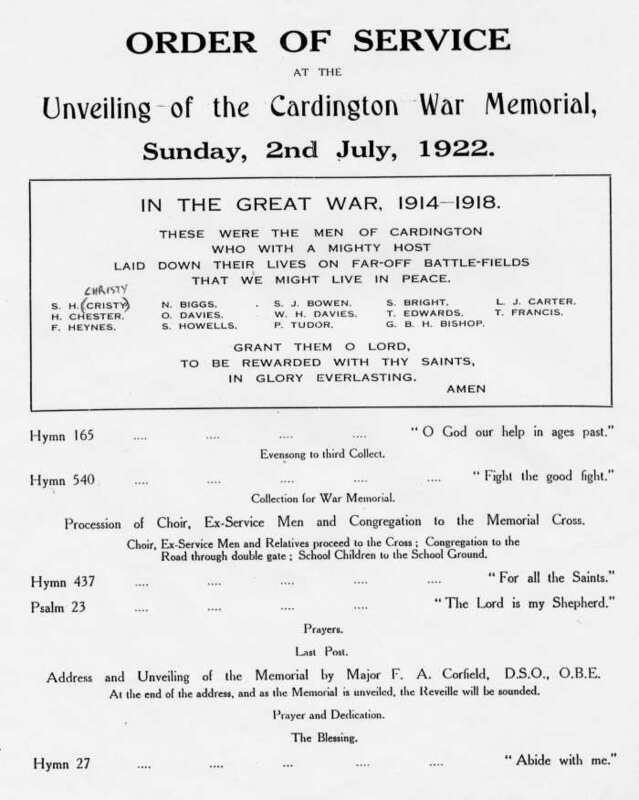 Corfield, D.S.O., O.B.E.. gave the address saying that he regarded it as a great honour to be asked to unveil the Cardington Memorial and eulogising the glorious dead, the Major then stepped forward and unveiled the Memorial Cross, the Bugler, Mr A. Pinch (formerly of the RWF Kinmel Camp) then gave the Reveille, all ex-servicemen standing at attention, the Cross is dedication in thankful remembrance of the following. Capt. S. H. Christy, 20th Hussars, Privates Noah Biggs (KSLI), Samuel Bright (KSLI), Lionel John Carter (S.I.Y), Oliver Davies (S.I.Y. ), Harold Chester(S.I.Y. ), William Davies (KSLI), Thomas Edwards (S.I.Y. ), Thomas Francis (S.I.Y. ), Frank Heyes (S.I.Y. ), Samuel Howells (S.t.Y. ), Pryce Tudor (KSLI), Rev. Geo. Bernard Hamilton Bishop, Chaplain (Northumberland Fusiliers). Beautiful floral emblems were placed at the foot of the cross including a large wreath from the exservicemen of the parish. The Hymn "Abide with me" brought this touching service to a close. Mr. W. Durston president at the organ and the bell ringers present, who rang a clear peal at the end of the service were, Mr P. Harley, Mr P. Harley junior. Miss Phyllis Harley, Miss Muriel Harley. The ex-servicemen on parade were in charge of Mr Pryce Dayus. 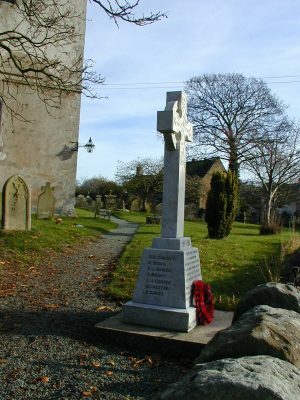 The churchyard cross is composed of polished white marble and bears the inscription: - 1914 -1918 "These were the men of Cardington who with the mighty host laid down their lives on far off battlefields that we might live in peace, (here follows the names recorded) Grant them 0 Lord to be rewarded with thy Saints in glory everlasting". There were over 100 ex-services present, the collection for the memorial totalled £6. 5 shillings, great credit is due to the churchwardens, Messors, Jones and Downes for the excellent arrangements made to accommodate so large a congregation.